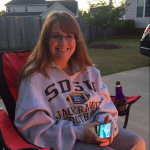 When my niece, Lindsay Hadlock Moore’s husband Shannon took a position as Special Teams Coordinator at East Carolina University, it meant that they would be moving from the Miami area of Florida to Greenville, North Carolina. 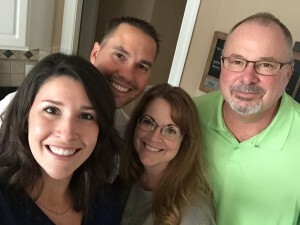 That also meant that in due time, my sister, Allyn Spencer Hadlock and her husband, Chris would be traveling to visit their kids in their new home. That time came this week, when Allyn flew out last Saturday, and Chris joined them on Wednesday after a work related trip to Chicago. As Allyn was getting ready to fly out, she sent out a text to the rest of my sisters and me to let us know that she was leaving and when she would be back. Of course, in our family of jokesters, it had to happen. Our sister, Cheryl Spencer Masterson made the comment that Allyn, who would be landing in Raleigh, would be flying into Andy Griffith Land. I laughed, and Allyn commented, “Yay, Mayberry.” Then she said that, of course, Lindsay actually lives in Greeneville, North Carolina, or more correctly, a suburb called Winterville…to which I commented, “Sounds like Mayberry to me.” and Cheryl commented, ” Greenville, Mayberry. Pretty close!” If you will recall, the big city that everyone went to on The Andy Griffith Show, was Raleigh…which got the whole conversation going in the first place. Mayberry, of course, was a fictional town based on Mount Airy, which is Andy Griffith’s hometown. Mount Airy is three and a half hours west of Winterville, and a place that maybe the family will go see someday, since there are a number of Andy Griffith related sights to see there, such as Andy Griffith’s house, the Andy Griffith Museum, the Mayberry Fountain, and the Mayberry Campground, and several more I’m sure. Of course, Andy Griffith…as much as we all loved him, was not the reason that Allyn and Chris traveled to Winterville, North Carolina. 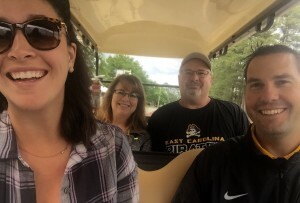 That honor belongs to their daughter and son-in-law, and now they are having a great time touring the campus of East Carolina University, and just spending quality time with their kids. It is always hard to have some of your kids living so far away, and you find yourself really looking forward to trips to see them, and their trips home to see you. they are having the time of their lives visiting, and really the only thing that has in common with Andy Griffith…is that this reunion is taking place in Andy Griffith Land. Sixty years…it is an age that many people dread, but for some reason, it just doesn’t bother me. When I look at my life, I find that there are memories over the past six decades that I will always want to keep in my memory files, but would I go back in time, if I could? No, I don’t really think I would. Each event in my life had it’s time and it’s place in the years of my life, and one would not fit in with the other. 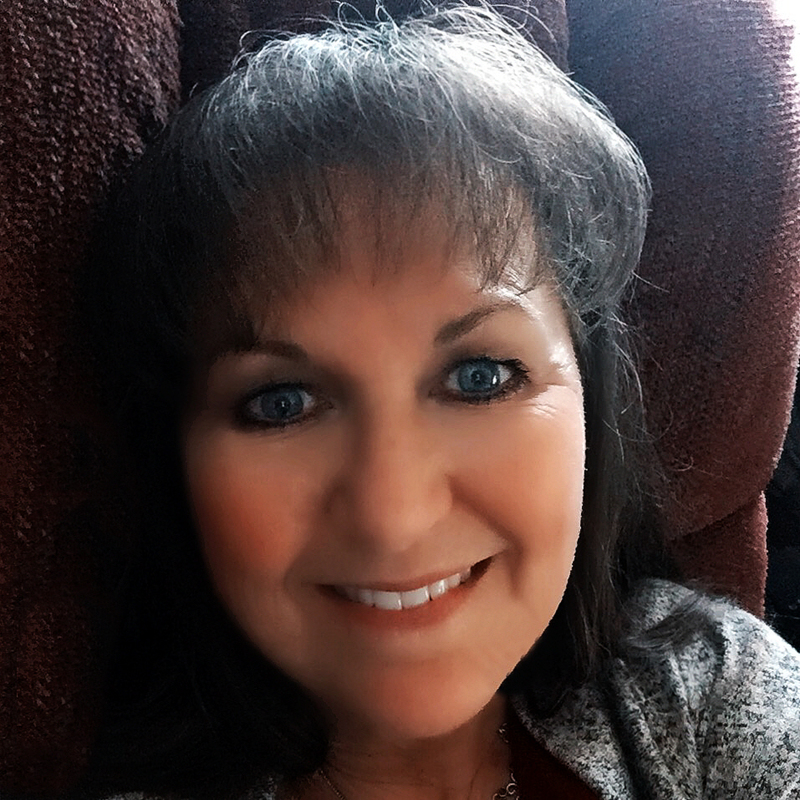 Knowing what I know today, would without doubt, detract from the memory of a different time, because I would know that someday loved ones would be gone, or children and grandchildren would move away. It would only serve to dim the brightness that goes along with a memory that carries with it, a promise of the future. Through the past sixty years, many things in our world have changed so much that going back would feel like we just entered the Stone Age. No, I’m not as old as dirt, as some people might say, but my generation has seen the invention of the computer, the Space Shuttle and the Space Age, the cell phone, DVD players and the versions that have come and gone before them, Skype and Facetime, the internet, and so many other great inventions. People from sixty years ago…could they step across the distance of time…would have passed out at all the things we have, and yet many of those very people invented the things we have today. The price of gasoline in 1972, when I started driving was just $.36 a gallon…and we didn’t like it much then, but let’s face it, riding the strip was simply not negotiable…everyone with a car did it. It was the weekend evening pastime for every teenager, and it didn’t matter if you lived in Casper, Wyoming, or Los Angeles, California…somewhere out there was a strip, waiting to be driven on. Those memories, and so many others, will always live in my memory files, but I still don’t think that is the place I would want to be now, because lets face it, we’ve all moved on from that world and that lifestyle. There are other things we would rather do now. Childhood, adolescence, teenage, and even young adulthood, would all be things I just don’t want to relive, except in my memory and my stories. Besides, I kind of like where I am in my life right now. That’s because I think that each stage of life is perfect in itself. And I’m right where I want to be. My Sister-In-law Caryn Is A Very Special Gal! Caryn became part of our family on March 1, 1975…over 41 years ago, when she married my brother Bob!!! Little did I know at that time that Caryn would become such an important part of the Schulenberg family. I don’t really remember too much of my life without Caryn being a part of it. She has been a major part of our family for so many years now…and I would never want to imagine our family without her as a part of it. 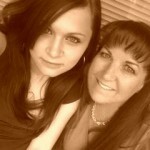 In the early years, Caryn spent most of her time raising her two girls, my nieces, Corrie and Amy. 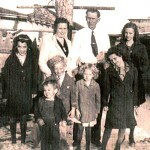 Then, before we knew it along came her four grandchildren my great nieces and nephews, Chris, Shai, Caalab and Josh. All of them are true gifts to Caryn. She really enjoys being a Mother and Grandma…and maybe someday soon (I hope not too soon) a Great Grandma! 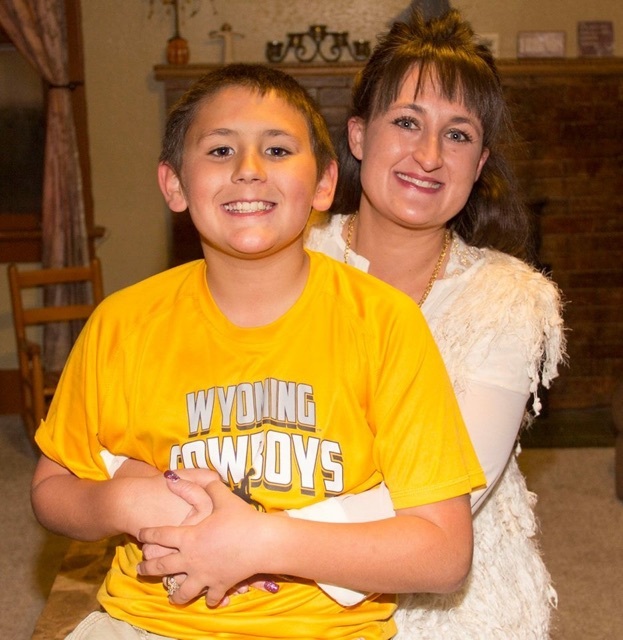 In August 2014, Caryn’s oldest grandson Chris moved to Sheridan to go to Culinary School. Now, next month Chris will graduate and then continue to live and work in Sheridan. Luckily, Sheridan is not too far away but it is still hard because we all miss him very much. 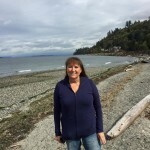 Caryn’s youngest daughter Amy, husband Travis and son Caalab moved to Washington State in June of 2015. This too was very hard for Caryn and the rest of us, but we have made the best of it and enjoy hearing about their fun adventures on Facebook. Bob, Caryn and their daughter, Shai have gone to visit and I’m sure Bob and Caryn will visit again soon. Rumor has it that Shai will be joining her family in Washington in July. Although we are all very sad to see Shai leave Casper, we do know how much she misses her family and how much they miss her. Caryn has always enjoyed bowling. She and Bob also like to go on walks and hikes when the weather permits. Bob and Caryn enjoy traveling for their annual hiking/anniversary trip to Thermopolis and to the Black Hills. They also travel for bowling tournaments too. Through the years, and as both sets of parents aged, Caryn was the primary care giver for all four parents…hers and ours. It was tough on all of us to lose them, but they are in a far better place now. My mom, Joann is still with us and living out at Shepherd of the Valley Care Center. Caryn is still very active in my mom’s care and we do appreciate everything she has and still does for her by going to all of her doctor appointments with her and keeping all of us up to date as to how she is doing. In October 2013 when I, myself, got sick. Caryn saved my life by convincing me that I had to go to the hospital. Had I not gone I think I would have died very soon after. 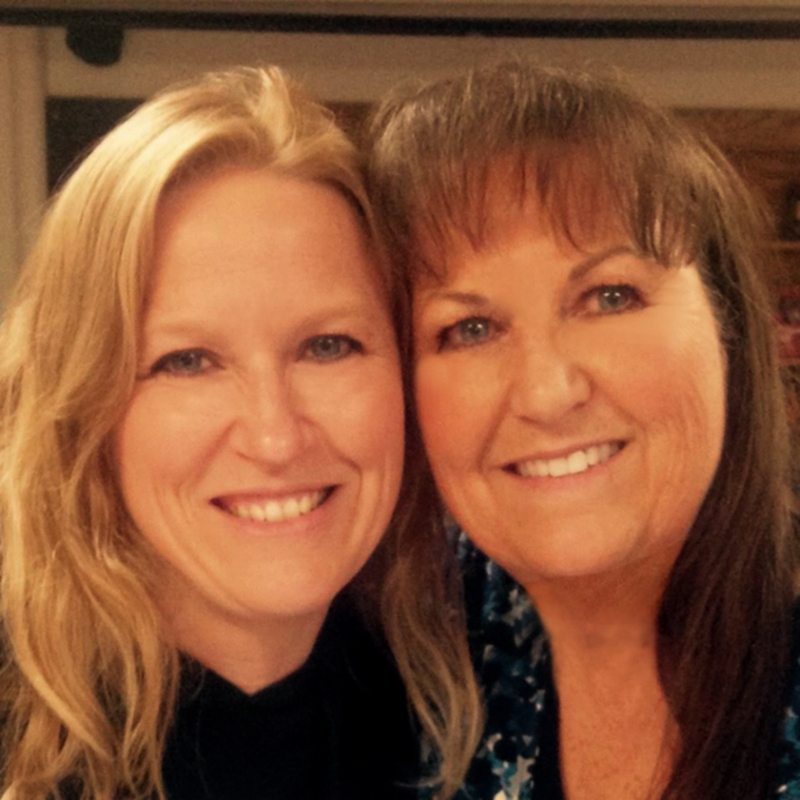 She (along with all of my other family, friends and co-workers) have been with me all the way in my long journey to a healthier life style…from going to the hospital, rehab at Elkhorn, and then once I went home she did whatever I needed help with. I couldn’t have done it without all of them. 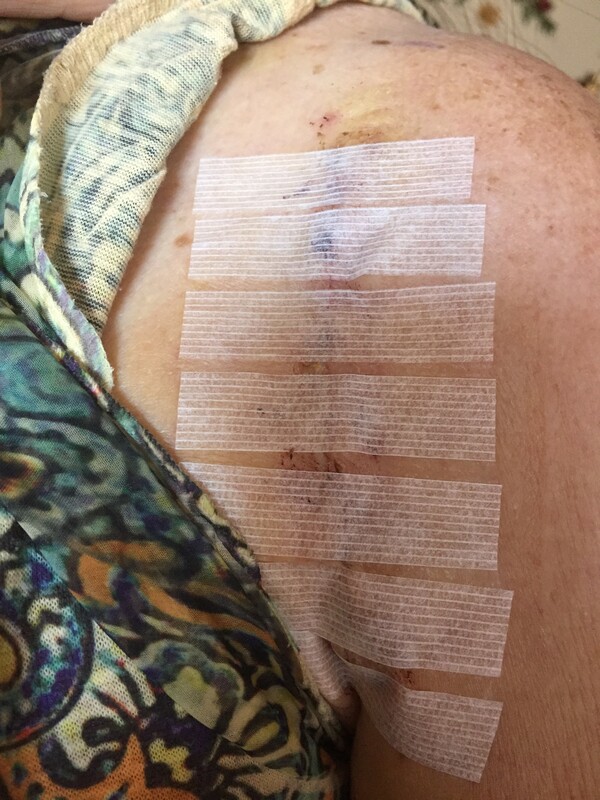 Caryn and my sister Jennifer will be traveling with me to Fort Collins, Colorado later this summer for my skin removal surgery…and I already know that Caryn and the rest of the gang will help me through the surgery and recovery too…because that is just how she is. On, October 18, 2015 my two year anniversary of going to the hospital seven of us hiked the Bridle Trail up on Casper Mountain. We all had a great time until Caryn fell and broke her shoulder. It was just one of those things. 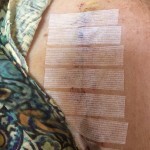 It was terrible as Caryn had to have surgery on it and months of physical therapy. This was hard for Caryn because she is so used to being the caregiver not the one needing care. Caryn was a trooper throughout it all, and she knew what she needed to do to recover and she did it. She recovered very well and very quickly. She was a star patient. Caryn is an amazing woman! She is one of the best sisters-in-law (I consider her my Sister) that I could ever ask for. 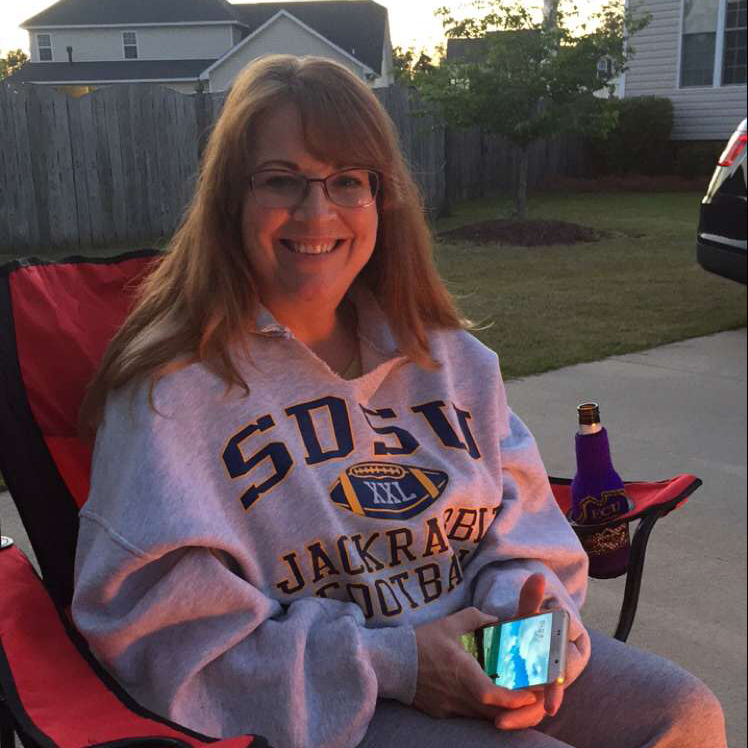 Today is Caryn’s 60th birthday (I know she still looks so young) and I just want to say Happy Birthday Caryn. We all love you and appreciate you very, very much!!!! 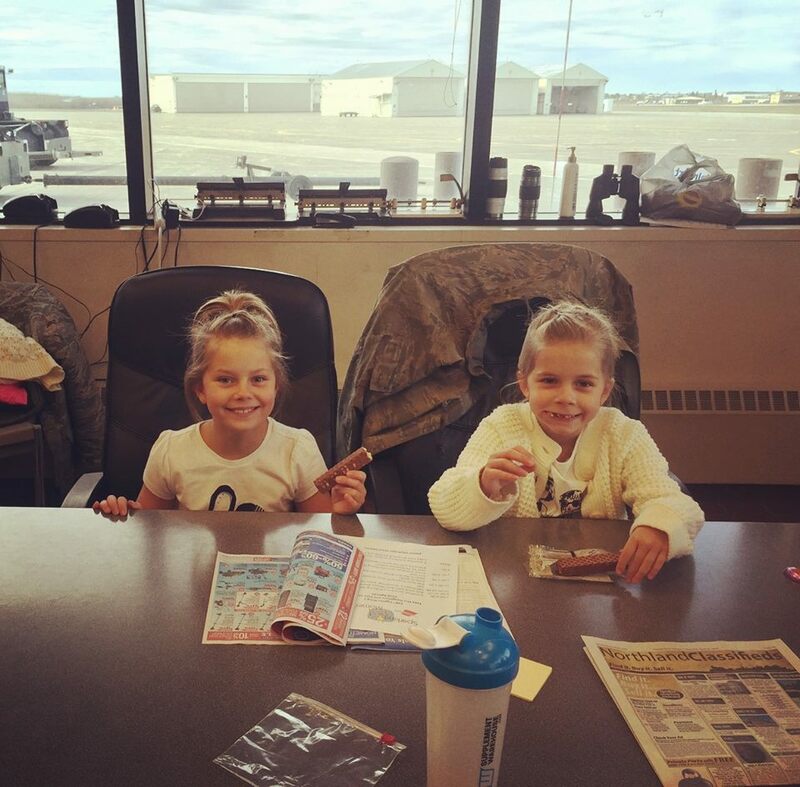 My cousin, Elizabeth Nordquist reminded me that today is “Take Your Son or Daughter To Work Day” when she mentioned that her husband, Aron is taking their girls, Addi and Meadow to work with him at the 148th Fighter Wing of the Minnesota National Guard. The girls think their daddy hung the moon, so I know they are getting ready to have the time of their lives. Aron’s job isn’t exactly your everyday, run of the mill job, afterall. It’s also a day away from their mom/teacher, that they get to spend with their daddy, doing all the cool things he does at work. The 148th Fighter Wing was established Sept. 17, 1948 and has approximately 1,000 members today…up from a starting point of just 50 men. The unit seen several aircraft changes over the last 68 years. They originally started with the propeller driven P-51D Mustang, and now they fly the supersonic F-16 Fighting Falcon. 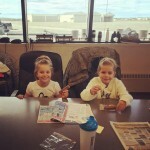 I don’t suppose any of that means much to Addi or Meadow, because all they really care about is getting to spend time with their dad at his work. And that’s really what this day is all about. Aron gets a chance to really shine in the eyes of his daughters. 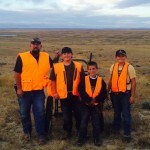 They get to see that their daddy has an important job to do, and that in reality, lives depend on what their daddy does. The whole point of “Take Your Son Or Daughter To Work Day” is to let our kids see what jobs their parents do all day. A child really has no concept of what a job is all about unless they get to see some of it first hand. The older they get, of course, the easier it is to explain our jobs to them, but when they are young, they think of it as being a lot like their play time. For Addi and Meadow, it might still seem a little bit like play time, because as you can see, they got to have goodies, but maybe it was break time…who knows. Last year, I too participated in “Take Your Son Or Daughter To Work Day” when I took my daughter Amy to work with me. Ok, ok, I admit, Amy worked with me, but she did go to work with me. Then, Amy moved to the Seattle area, and now to Ferndale, Washington, so she could not come with me. Nevertheless, I decided not to miss out, so I took my granddaughter, Shai Royce to work with me…and my boss, Jim Stengel even agreed to pay her for the day. No, it wasn’t that he was doing anything that he wouldn’t do for her on any other day, because she works with me now, so he always pays her, but I did get to participate in “Take Your Son Or Daughter To Work Day” anyway…and it was a great day. As a young man of just under 20 years, my dad made his first trip overseas. It was the height of World War II, and Dad was the Top Turret Gunner and Flight Engineer on a B-17G Bomber in the 8th Air Force 385th Bomber Group. His bomber group had flown to Great Ashfield, Suffolk, England early that April. While they were at war, and that was a scary thing for any sane person, there was also a part on my almost 20 year old future dad that felt a bit of excitement. He was in a new country…an old country by the world’s standards, with things and places we just didn’t have in the relatively young United States. There were castles and old churches to see. In the United State, we had churches built of logs and wood, and modest homes often built the same way, but in England, there were buildings that had an artistic side to them. There were so many sights that he would not be able to see at home, and might never see again. No wonder her was excited. 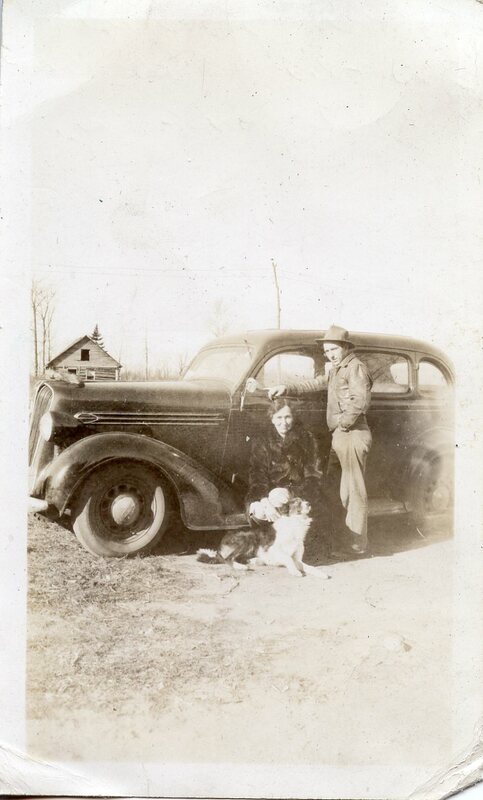 Dad knew of the dangers he and his fellow crewmen were facing in England and over Europe, but the excitement of being in a completely different country, so far away from home was something that was hard not to like. He found the people interesting, the structures elegant and beautiful, and the climate different from what he was used to. 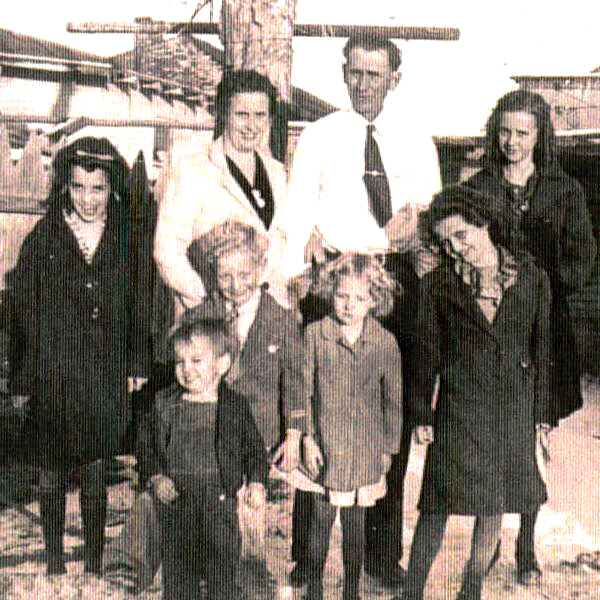 Of course, he missed his family, and wanted to make sure his mother didn’t worry too much, so that might have also been the reason that he always tried keep his letters light. 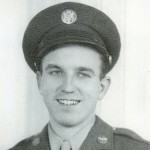 For me, having the advantage of knowing that he made it through the war and came home safely, it is easy to look beyond my dad’s careful words, to the excitement that lies behind them. Dad always loved to travel, and while this was clearly different, it was still travel, and by airplane, no less. What young man of 19 years wouldn’t be excited about all the new things he was able to do and see. My dad has been in Heaven for almost ten years now, and I miss him terribly. His kindhearted ways endeared him to everyone from family to friends. Dad was always the thoughtful one…always a gentle man…and a gentleman. He wasn’t harsh, and he was always a gentleman when it came to treating women in the way they should be treated. 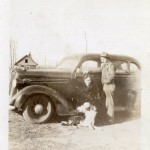 Dad was quite possibly the last of the Southern Gentlemen…even if he wasn’t from the South. Looking back now on the ten years that he has been gone, I know that I miss him just as much today, as the day he left us…and I always will. Happy birthday in Heaven Dad. I know you and Mom are having a fine time. Just know that you are always in our thoughts. We love and miss you so much. My grand nephew, Zackery David Spethman is an eleven year old boy with a lot going for him. 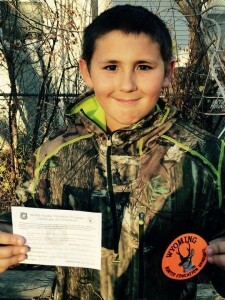 This past November, he took and passed the Hunter Safety course, and he can’t even go hunting until he is twelve. Not many kids would take the course a year and a half before they would even benefit from it…and I have my doubts that most kids who are just ten years old, would even be able to pass the test, but Zack did, and we are all very proud of him. Zack is a very tenderhearted boy. His mom, my niece, Jenny Spethman says that he “loves deeply and feels deeply” about people, He doesn’t like getting his feelings hurt, and so is very careful not to hurt the feelings of others. He doesn’t ever want to be the one to inflict pain on someone. Zack is a huggy boy. He is quick to give a hug to those he loves, and very quick to try to cheer up a person who is sad. And one of his favorite things to do is to make his little sister, Aleesia laugh. Zack is, nevertheless, all boy. He loves to play football, go bowling, go shooting with his parents, and play cops and robbers with his brothers, Xander and Isaac. For Zack, the season makes no difference. Jumping into a snow drift is just as much fun as jumping into a pile of leaves. He just loves life, and doesn’t want to miss a moment of it. He loves watching movies with his siblings, and his parents, and like most kids, the super hero movies are the best, but he has also watched a lot of war movies. 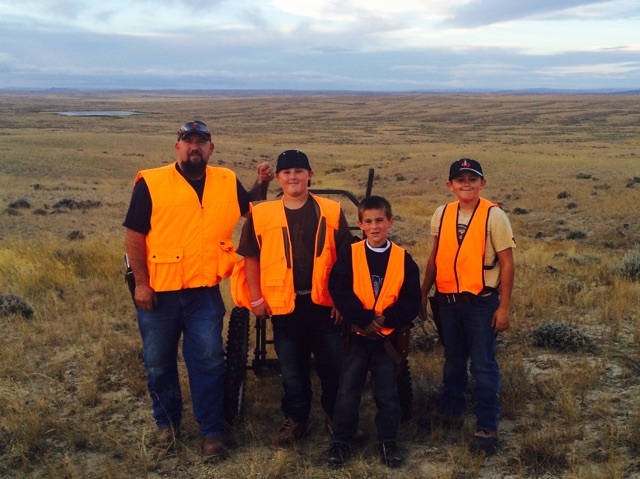 His dad, Steve Spethman, was a marine, and he wants his boys to understand the need to stand up for what you believe, and even to fight for it if necessary. Steve and Jenny have taught all their children good moral values, and not to be afraid of doing what is right. These are values that so many kids are not taught these days. Zack is not afraid of hard work. He and his brothers have often headed out after a snow storm ready to tackle the neighborhood sidewalks and driveways…for a profit, of course. They understand that if you want to have money, you need to work for it. It’s the only right way. I realize that at eleven years of age, it is a little difficult to have a steady job, but he isn’t too young to be industrious enough to make a few bucks here and there by doing work for the neighbors. Zack is just such a kid. 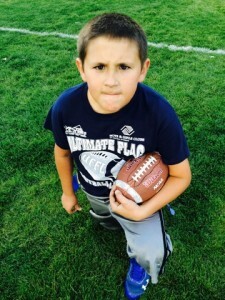 He has lots of great plans for his life, and while he is still a kid, he is loving life on a daily basis, and isn’t that what it’s all about at eleven. Today is Zack’s 11th birthday. Happy birthday Zack!! Have a great day!! We love you!! 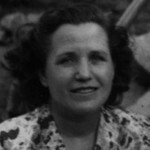 When my great aunt, Bertha Schumacher Hallgren passed way in 1984, much had changed in our world, in comparison to the world she found herself in as a young girl. 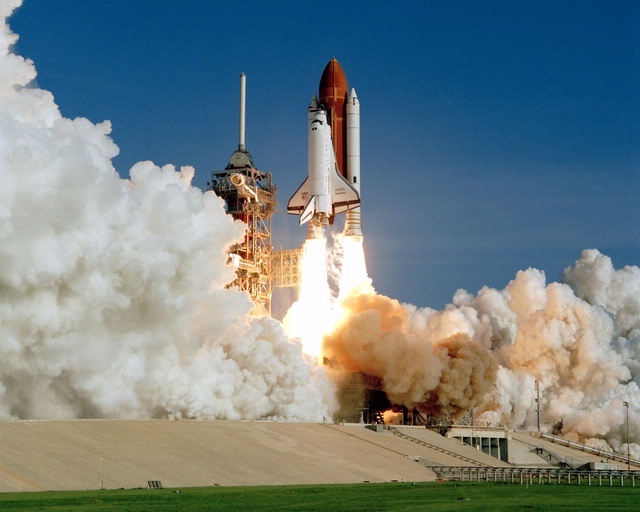 To me, one of the most significant changes would have been in the area of flight…regular flight or space flight. Bertha was a very curious girl. She thought about things, and thought things through. That is the reason that she included facts of the times in her journal. I do wish she had published her works, because I think they would have been of great interest to a lot of people, even if they weren’t written about their family. 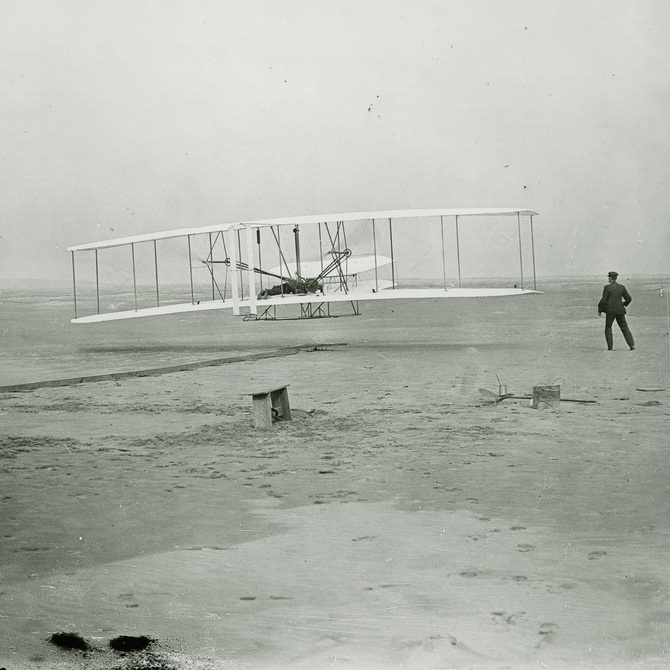 The first flight took place when Bertha was just a young girl of four years, so she grew up knowing that flight was possible, but there is no indication in her writings, that she ever flew on a plane. The space program began in 1961, so she saw space flight too, and I’m quite certain that she really thought that was an amazing feat, but it did not make it into her writings either. 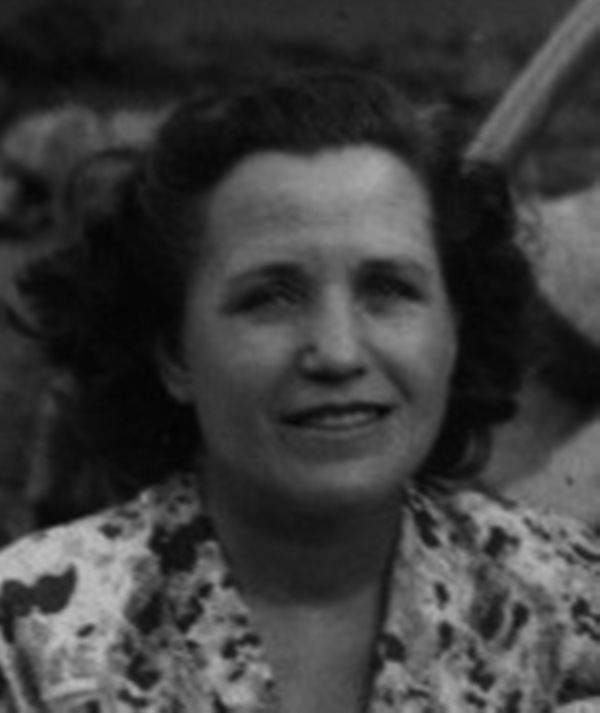 Perhaps, by that time in her life, she thought that there just wouldn’t be much interest in her writings, aside from possibly her sister, Mina Spare’s daughter, Pauline, and later maybe her grandchildren, who were given a copy of the journal, thereby preserving this amazing book, whether accidental or not. 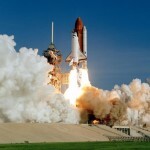 By the time Bertha passed away in 1984, she had seen the first Space Shuttle launch that took place on April 12, 1981. 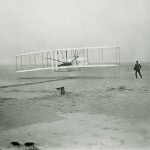 I have to think that she must have been very much amazed that a plane could fly into space, and return to earth again with the ability to land using its own power, to land not by dropping in the ocean, as had always been the case, but rather by landing on a runway, just like a regular plane. 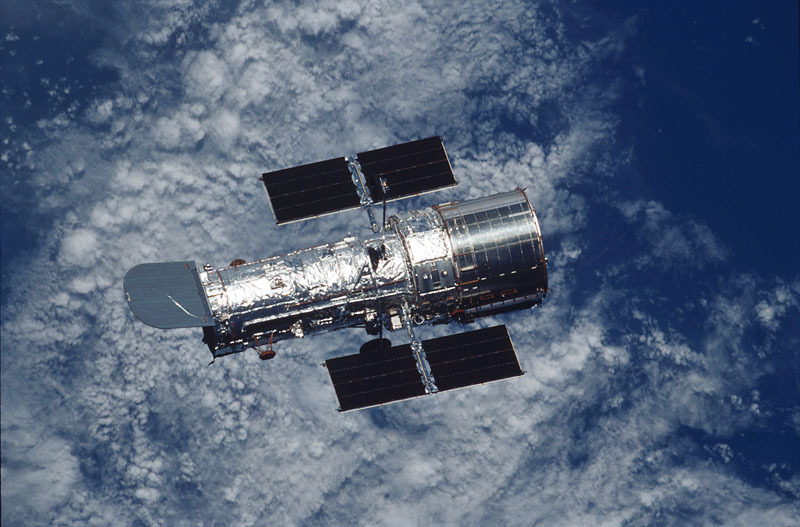 Unfortunately, the placement of the Hubble Space Telescope came to pass just six years after Bertha’s passing, on this day, April 25, 1990. I find that particularly sad, because I think she would have loved that. 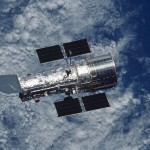 I can picture her watching the news on television just to catch a glimpse of the space that surrounds our own galaxy. And I can picture her look of wonder as she thought about this amazing world of change that we live in. It was a place that always fascinated her, and I know that it did until the day she died. As any photographer knows, half the battle is being in the right place at the right time. Everyone loves a great photograph, especially the ones that capture something that isn’t often seen. Being in the right place at the right time is crucial, because some events don’t happen very often…especially in front of people. That is exactly where my daughter, Amy Schulenberg Royce found herself recently. 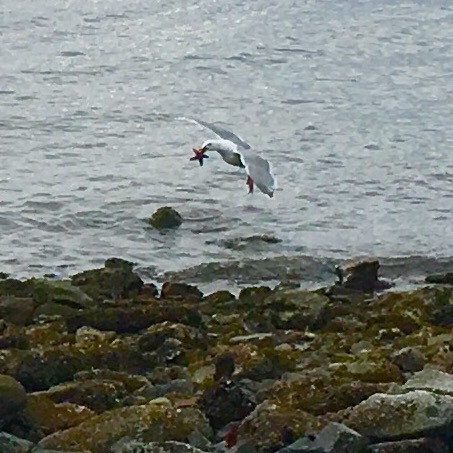 While walking on the beach near her Ferndale, Washington home, Amy commonly sees seagulls in flight. 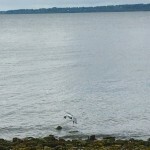 The Puget Sound is a prime feeding ground for seagulls, so they are everywhere. 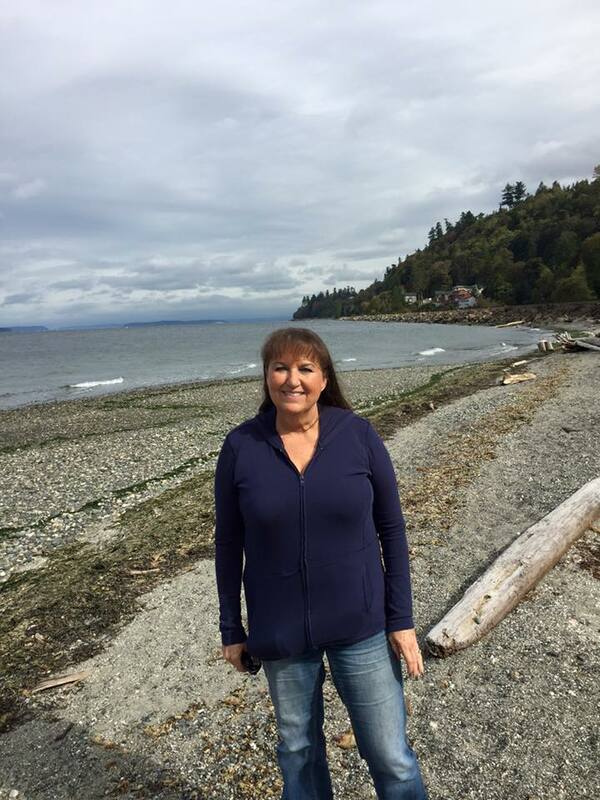 Amy loves to walk along the beach, view the sunsets, and listen to the sounds of harbor life. The horns of the ferry boats, the gulls squawking, the waves splashing onto the shore, and the people out enjoying themselves. 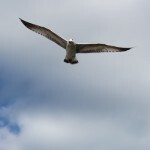 It was during one of these peaceful walks that a seagull flew in close to shore. 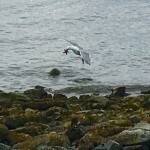 Amy took a picture with her iPhone and then realized that this gull had a starfish in it beak. As he landed, she scrambled to take more pictures, but he didn’t stay long. 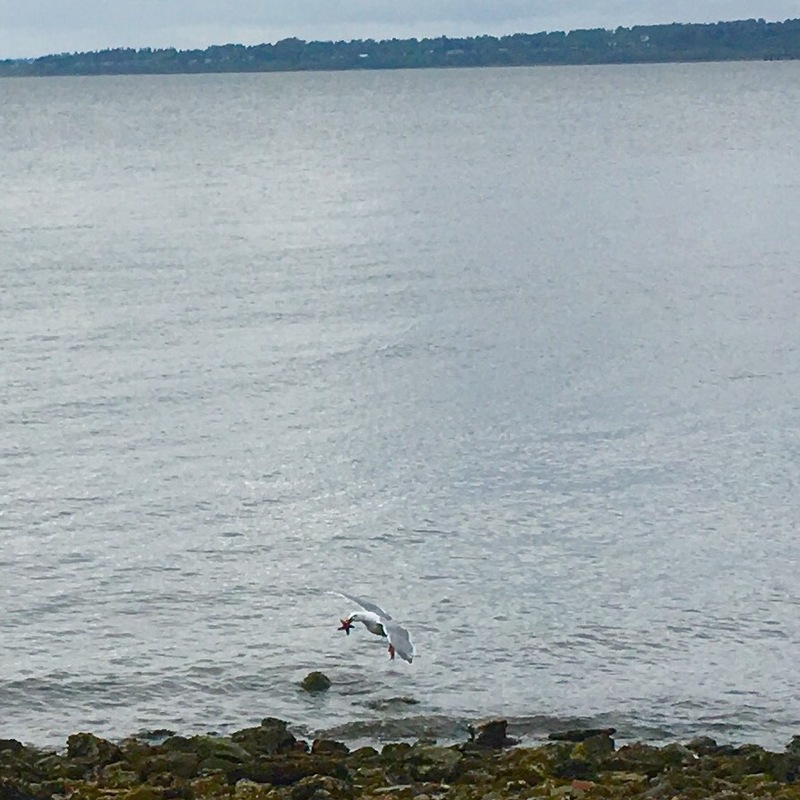 When she looked at her pictures, she realized that the first picture…the one where she had no idea that the gull had a starfish, was the perfect photo capture. What an exciting moment that was for her. It wasn’t planned, it wasn’t staged, it was just perfectly right…all by itself, with no help from anyone. All she had to do was snap. I’ve looked at lots of photographs taken by lots of photographers, professional and amateur alike, and while planned shots are great, it is the shot that was pure chance that sticks in your memory files. 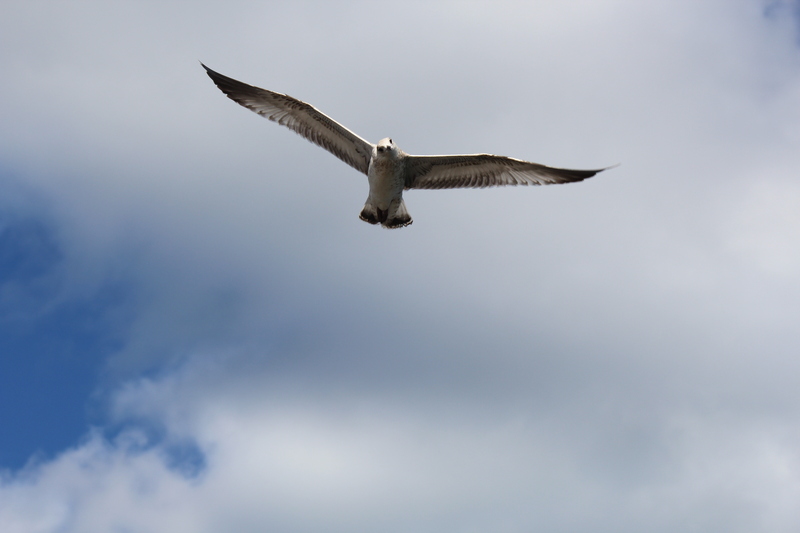 The one where a seagull looks right at you, because he can’t figure out what that human, with a camera on its face, is exactly. Or as in Amy’s case, the picture you took when you didn’t know what you had…yet. Those are great, because they are such a nice surprise. It may be a really long time before Amy finds herself in the right place at the right time to see a seagull successfully capture a starfish, or it could happen again tomorrow…if she finds herself in the right place at the right time again. These days there are so many public schools in the United States, that they have become something we give little thought to. That was not always the case, however. As people moved West to populate this great nation, many mothers had to homeschool their children. Eventually, schools began to spring up across the prairie, but what about the schools back East. This nation didn’t always have schools. Things had to be established first. And considering the fact that America was discovered in 1492, it would seem to me that the schools were a bit behind the times. 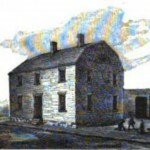 The first public school in the United States, was established on this day, April 23, 1635, in Boston, Massachusetts. 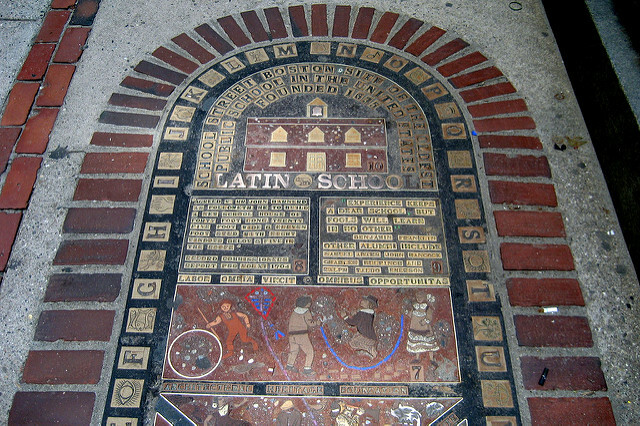 The school was called the Boston Latin School. At the time the school was formed, English was not the only language spoken in the United States, so learning Latin, which was considered to be the root of European language, was also a priority, as it was with grammar schools in England. 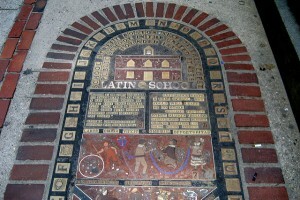 Seventeenth-century schoolboys throughout Europe, Catholic or Protestant, learned Latin, and which explains the focus of Boston Latin. One of the main reasons for education, as far as the Puritans were concerned, was to be able to read the Bible. One of the main reasons for the pilgrimage to the new world was religious freedom, and they felt like it was essential that their students be schooled in the important languages, so they could read the Bible and other important books for themselves. Boston Latin School has prided itself on the number of its students who attended Harvard, or some of the other prestigious four year college. When I think of the first school in the United States, and the history thereof, I think of my Aunt Bertha Schumacher Hallgren. She mentioned in her journal that in writing a family history, the author should mention things that are interesting about the times the people in the family lived in. She also had a type of love-hate relationship with school. 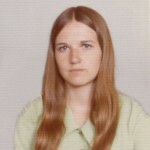 As a young girl, all she really wanted to do was to stay at home with her mother, but she also understood the importance of a good education, for without it she would not have been able to get the jobs she was able to get, which were good jobs, especially for a woman at that time in history. 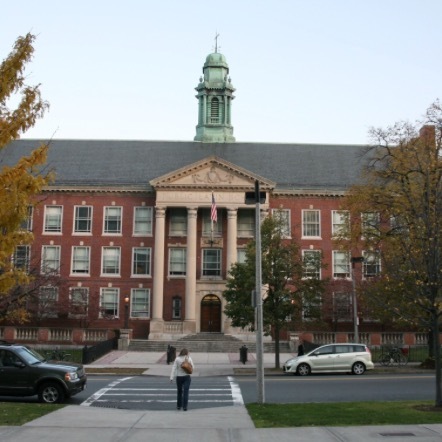 Whether we enjoy school or not, it is a gateway to almost every opportunity there is, and in the United States, it started with Boston Latin School. Whenever I think of my Aunt Deloris Byer Johnson, I can’t help by see her smiling face. Aunt Dee was the inventive one in my mothers family. She had a way of creating fun. 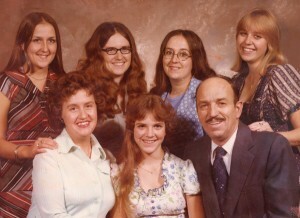 If she was around, her siblings knew that things were about to get crazy. She might decide to see if a couple of kids could really fly in the wind with a big trench coat on, or she might decide to teach everyone to dance. With Aunt Dee, there was never a dull moment. Aunt Dee was always filled with anticipation about the next step in life…even if it was just the next day. She always expected something amazing to happen, and if it didn’t, she figured out a way to make something happen. Aunt Dee wasn’t a troublemaker, just an excited kid, who made things happen in her life…fun things, and the beneficiaries of her playful spirit. 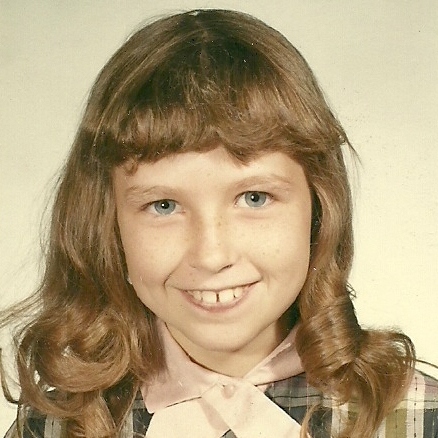 My mom, Collene Byer Spencer, used to tell me about all the fun things the kids did with her sister’s help. 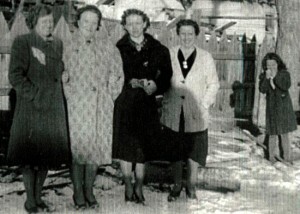 They were memories of her sister, that my mom treasured all her life. Mom and Aunt Dee were always close. They shared a joy for life that somehow kept them young at heart. 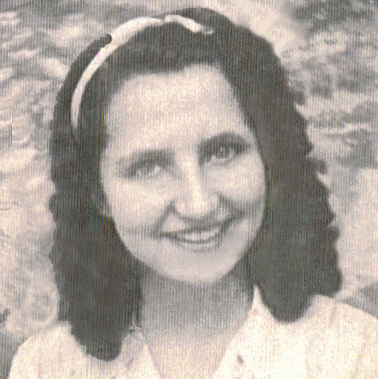 When Aunt Dee got sick, I would have thought that they joy might have been gone, and perhaps it was as time went on, but in the early days of her illness, That sweet smile was still there. Every time I saw her, it was as if she was trying to cheer everyone else up. After her passing, I think that the world seemed a little bit dull, because Aunt Dee’s sweet spirit was not with us any more. 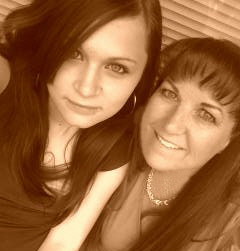 She had always been a big part of my life, and I knew that I would always miss her very much. I know that I will see her again in Heaven, and I look forward to seeing her again. 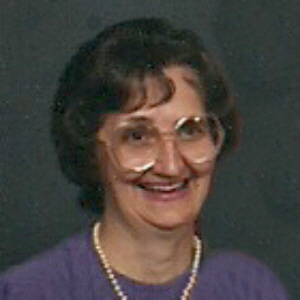 Today would have been Aunt Deloris’ 85th birthday. Happy birthday in Heaven Aunt Dee. We all love and miss you very much.